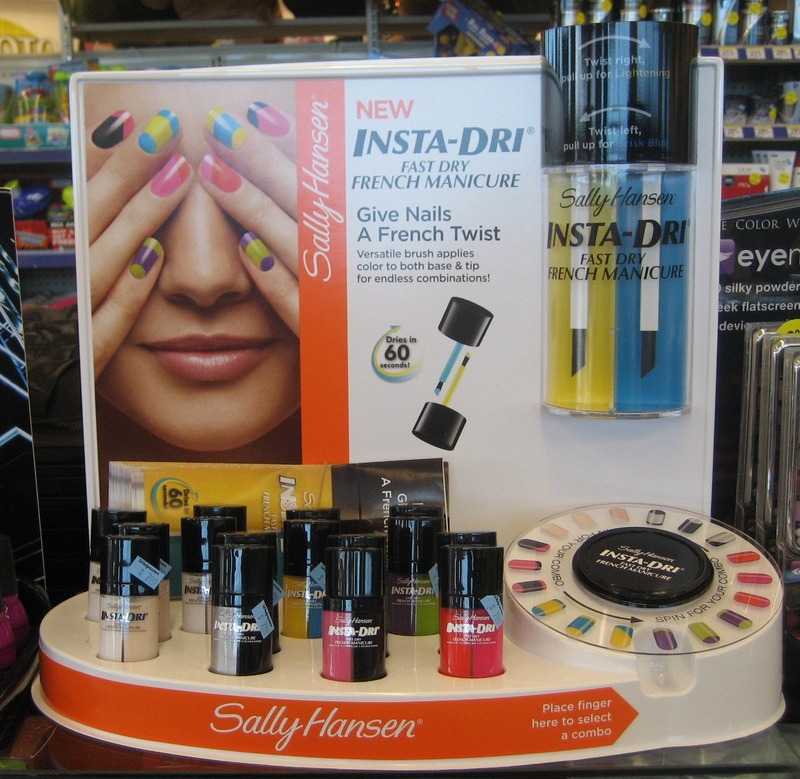 Sally Hansen has come out with several new displays recently. 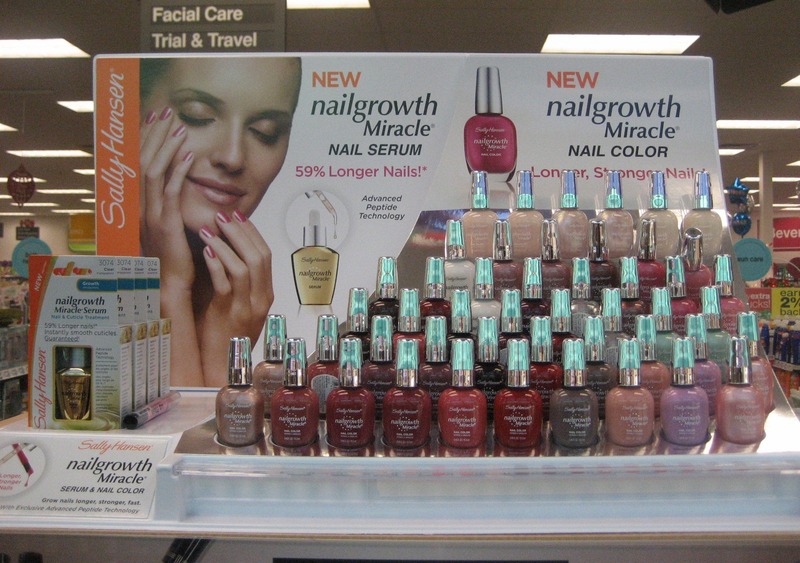 Nailgrowth Miracle is a new line, which I suspect is replacing Maximum Growth, as that's went on clearance at a lot of drugstores around the same time as I started seeing these new displays. 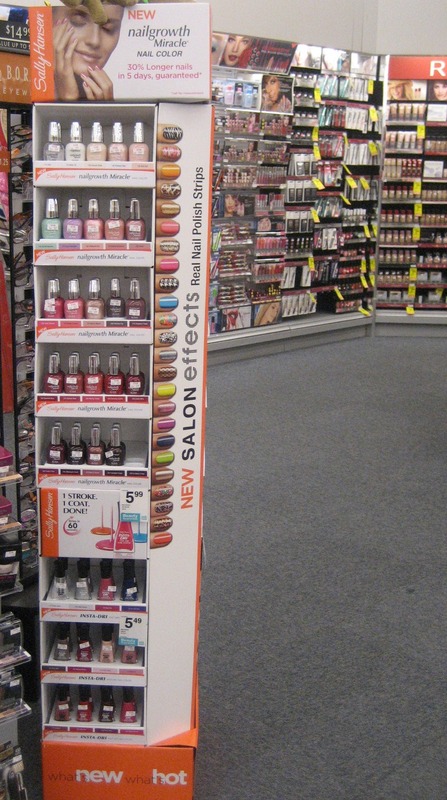 The brochure says this polish has "Biotin, Keratin, and Vitamins" and it "reinforces nails from cuticle to tip". 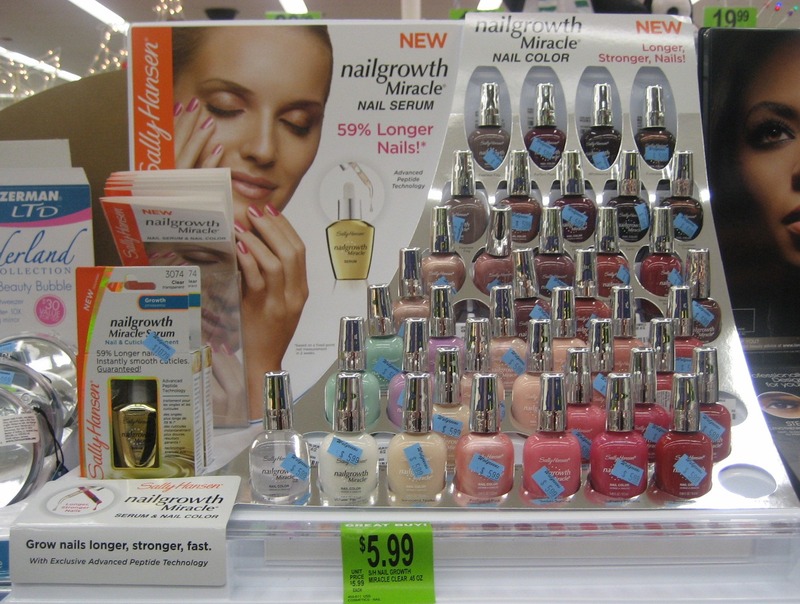 I've seen two configurations of the display; both seem to have the same colors plus the Nailgrowth Miracle Serum (which has an eyedropper tip, so it's not a treatment polish but seems more like a cuticle oil, not that I've sampled it). Most of the shades are pretty classic, which means I didn't feel compelled to buy them. There are 24 colors in all; the most interesting ones to me were Fearless Fog (a taupe creme), Forbidden Fudge (a brown shimmer that I liked as much for the name as the color), Gentle Blossom (mint green shimmer), and Loyal Lavender (light red violet shimmer). Lined up at my Ulta one day were new displays of Insta Dri, Extreme Wear, and Diamond Strength. I'm not sure if these are limited edition or new colors or what. The Insta Dri colors are Silver Sweep, Rose Run, Co-Bolt Blue, Slick Slate, and Magenta Motion. Xtreme Wear are Lacey Lilac, Grey Area, Mint Sorbet, Posh Plum, and Blizzard Blue. Diamond Strength are Pretty Petunia, Peach Pave, Rosy Future, Save the Date, Lilac Chantilly, and Tyin' the Knot. In addition to the Insta Dri above, another display with a new Insta Dri bottle configuration has also been popping up. This is for the Insta Dri French Manicure duos, which have two colors in one container. The directions say to twist the top right to use the shade on the left and twist right to use the shade on the left—that seems a bit confusing. The brush on these is different than the regular Insta Dris; this one is angled. There are eight combinations offered, all of them as far as I can see using existing colors in the core line. Three are traditional French; five are funky. 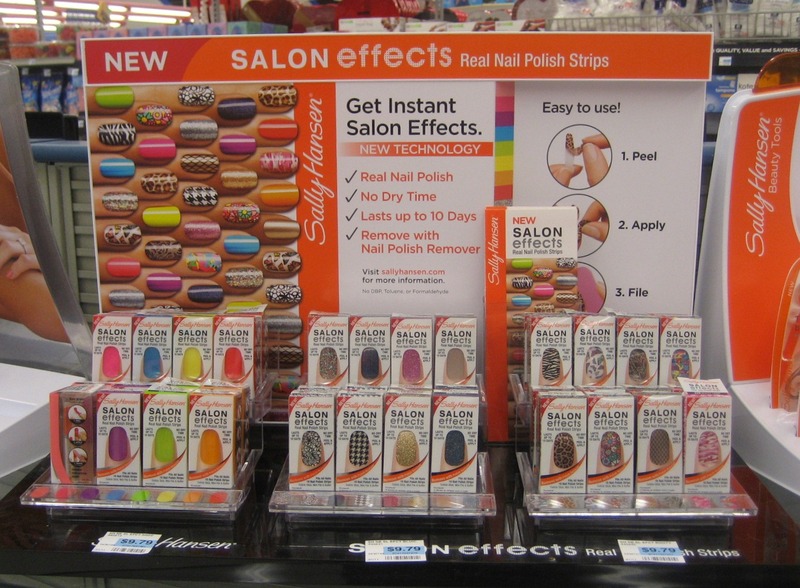 I did buy at least one color from each of the displays above (who knows when I might get around to swatching them) but haven't yet gotten anything from the other recent Sally Hansen display I've seen, the one for Salon Effects stick-on nail polish strips. Some of the designs look really appealing, but I can't quite see paying almost $10 for a product I'll get one mani from (though I suppose if I only used as accent nails I could get more). I'm hoping they go on sale soon. There are 24 colors: 8 bright cremes, 4 blingy glitters, 1 subtle glitter, and 11 nail art designs. There's also a new floor display I've seen which has a combination of lines in it: Nailgrowth Miracle, Insta Dri, Salon Effects, and so on. All this, plus new Complete Salon Manicure limited edition shades are coming for spring, inspired by the Tracy Reese and Prabal Gurung collections. I really must start some destashing to make room for all these. Thanks for the pictures. :) I don't find any of these exciting- not even the new funky french ones. Awesome! thanks for the pictures :) I haven't seen any of these new collections yet but usually they come out a bit later in Canada. Btw, I just tagged you, but you don't have to do anything with it if you don't want to. How I would love if we had stores like that over here. Sure, my wallet would hate my guts, but I'd be happy. oh karen..how can you control yourself from buying it all? I don't think I could..I would take everything and put it in my basket. Those duo-insta dris look weird and very gimmicky lol!